The Singareni Collieries Educational Society (SCES) has been imparting quality Education to the children of employees of The Singareni Collieries Company Limited (SCCL) and the children of surrounding areas spread over in four erstwhile Districts of coal belt Area covering Zone-V viz., Khammam, Warangal, Karimnagar and Adilabad through its Educational Institutions, since 1975. The SCES is solely funded by the SCCL. The SCCL is the sole coal producing industry in south India to meet the coal needs of industries and power sector. i) For Lecturer in Commerce - Rs. 40,270/- per month as per G.O.Rt No. 149 dated 01.06.2017.
ii) For Jr.Assistant and Lab Assistant – Rs. 15000/- per month as per G.O.Ms. No. 14 dated 19.02.2016.
iii)For Class –IV – Rs. 12000/- per month as per G.O.Ms. No. 14 dated 19.02.2016.
i) For Jr.Lecturers in Physics, Zoology - Rs. 37,100/- per month as per G.O.Rt No. 162 dated 16.06.2017.
ii) For Office Superintendent – Rs. 22,290/- per month as per G.O.Ms. No. 14 dated 19.02.2016.
iii) For Jr.Assistant – Rs. 15000/- per month as per G.O.Ms. No. 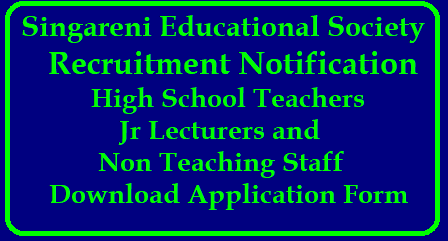 14 dated 19.02.2016.
i) For Teachers - Rs. 17,500/- per month as per G.O.Ms. No. 14 dated 19.02.2016.
ii) For Jr.Assistants – Rs. 15000/- per month as per G.O.Ms. No. 14 dated 19.02.2016.
iii) For Class – IV – Rs. 12,000/- per month as per G.O.Ms. No. 14 dated 19.02.2016. Maximum 44 years. The age is reckoned as on 01/07/2018 i.e. A candidate should not be born before 02/07/1974. The upper age limit prescribed above is however relaxable in the following cases: 1. SC/ST and BCs relaxation of age is permissible upto 5 years. 2. Physically-Handicapped persons relaxation of age is permissible upto 10 years.